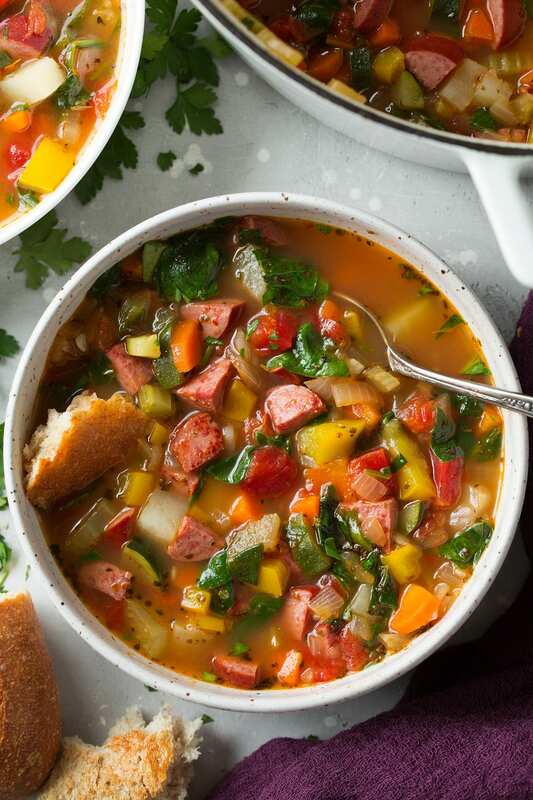 Sausage and Vegetable Soup is flavorful, delicious way to eat tons of veggies at once (it’s got potatoes, bell peppers, carrots, zucchini, spinach and more)! And finally a meaty vegetable soup. 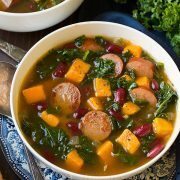 It’s loaded with turkey kielbasa sausage and it’s sure to satisfy! This winter I’ve been making so many vegetable soups. From this Vegetable Chili, to Mexican Lentil Soup, to Creamy Tortellini Minestrone and Gnocchi Vegetable Soup with Pesto. 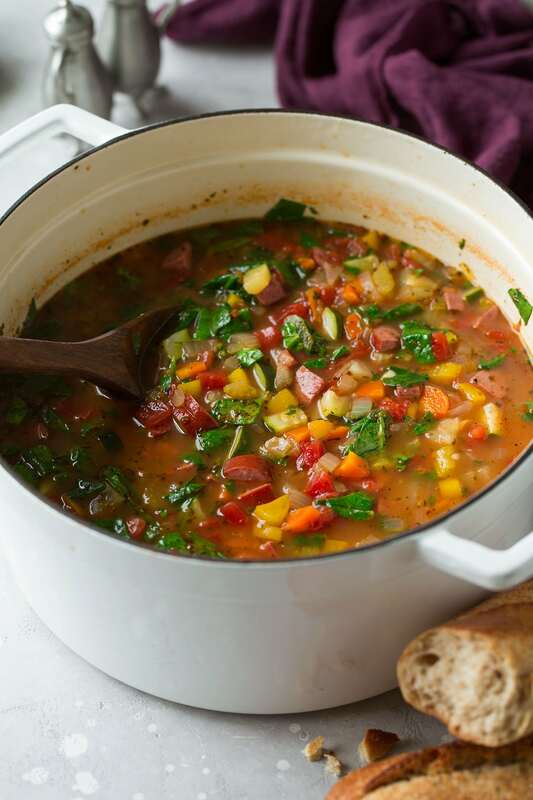 Oh and Let’s not forget this Super Easy Cauliflower Vegetable Soup. So vegetable soups have totally been my thing this season. But I think it’s about time I made one of them meaty. We’ve loved the others but it’s nice to have some meat to change things up with flavor. And yes indeed does that smoked sausage bring flavor! 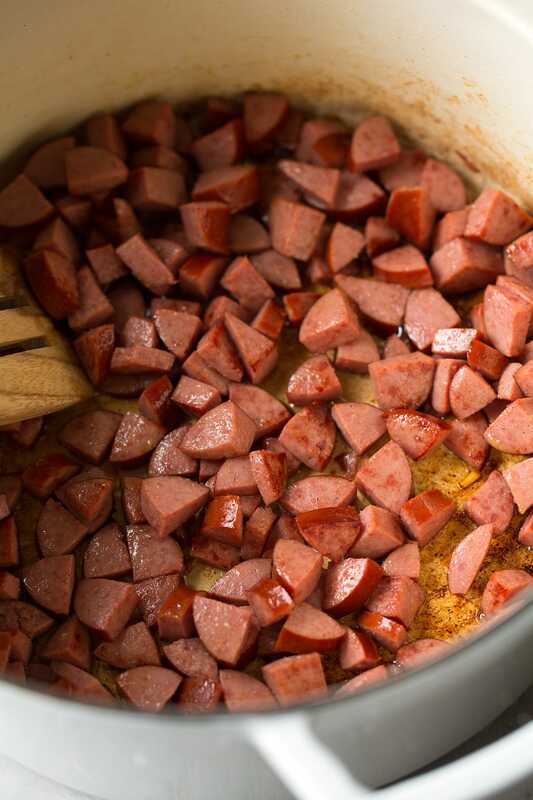 Add in sausage and let brown about 2 minutes then toss and let cook 2 minutes longer. Transfer to a plate while leaving remaining oil in pan (should be about 1 Tbsp). Add another 1 Tbsp olive oil, then add onions, carrots and celery. Saute 3 minutes. Add bell pepper and garlic and saute 2 minutes longer. Pour in broth, tomatoes, potatoes, Italian seasoning and season with salt and pepper to taste. Stir in sausage. Bring mixture to a boil, then reduce heat to medium-low. Cover and simmer 15 minutes, stirring occasionally. Stir in zucchini and cook 10 minutes longer, or until veggies are tender. Stir in spinach and parsley and let warm through. Serve warm with parmesan cheese if desired. 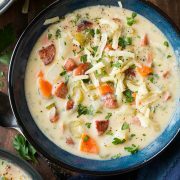 This is total comfort food – made healthier! I used turkey kielbasa sausage but feel free to use a beef/pork kielbasa if you’d rather. And add some parmesan for more flavor, not a must but you can’t go wrong with a little parmesan! Then feel free to swap out some of the veggies listed here with some you may already have on hand like cabbage, butternut squash and so forth. 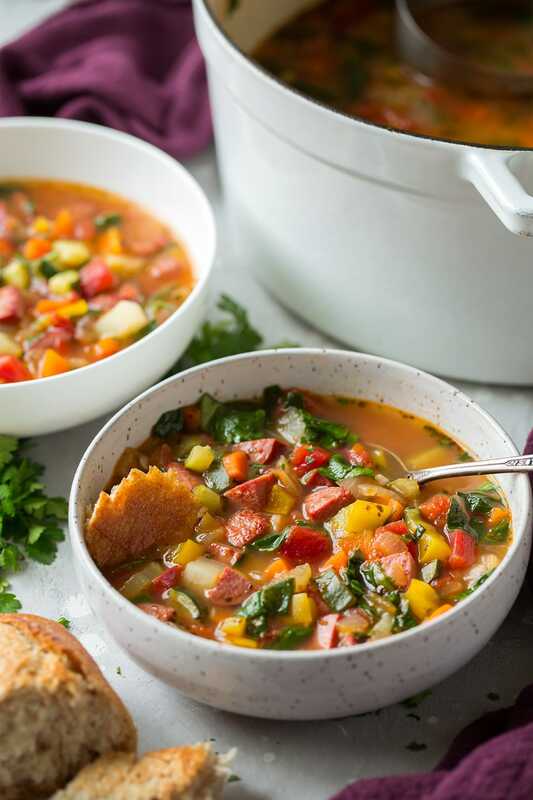 Finally a meaty vegetable soup! 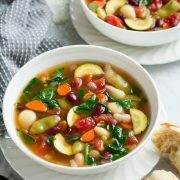 This soup is easy to make and it's jam packed with nutritious veggies. 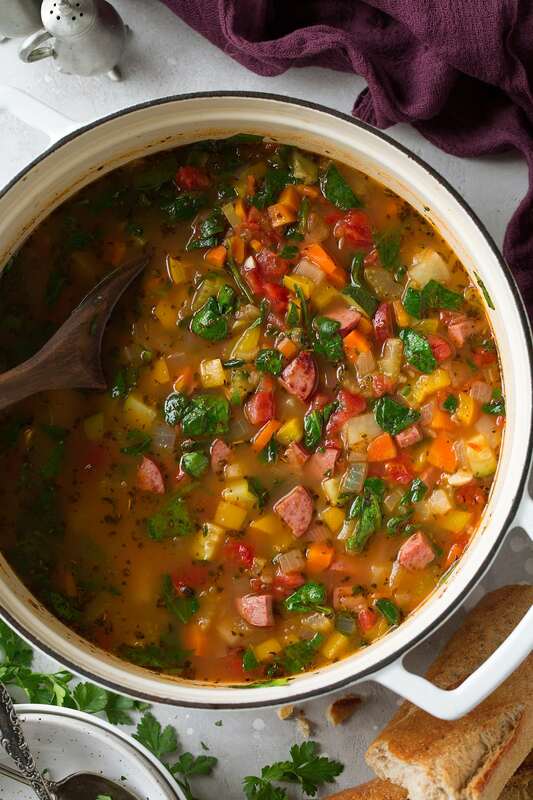 The smoked sausage adds a great flavor and makes this soup that much more hearty. Serve it with some fresh crusty whole grain bread for an ideal winter dinner. Jocelyn: This was delicious, a lot of chopping, but well worth it. It was a terrific way to get my family to eat their vegetables.